If you are looking for some new bonus packed slots to enjoy then take a look at our reviews of three of the best to have been released in the last few days. 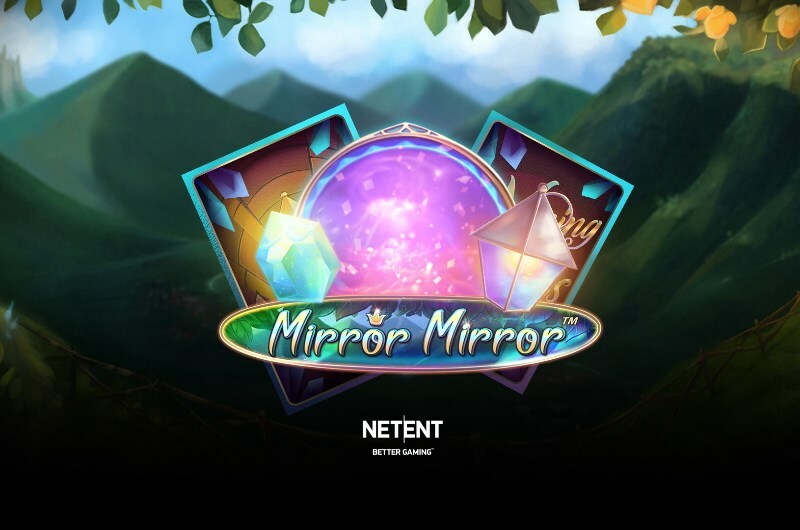 Fairy tales are often thought of as being for children, but in NetEnt’s new game Fairy Tale Legends: Mirror Mirror, you are sure to enjoy a return to your younger days as you help the princesses battle the evil queen to be in with the chance of some huge winnings. It is a 5 reel slot with 3 rows and 243 ways to win. The transparent reels are set against a view of a fantasy landscape full of rolling hills and castles, with the princess watching from the side. The high value symbols include the game’s logo, the princess, the evil queen, a large jewel and a lamp. The lower value symbols are the playing cards 9 through to A. There isn’t a wild symbol, but there are two bonus symbols, the mirror and the gold box, each of which has its own special feature. When the mirror symbol lands on the third reel a Mirror Respin is granted. First, the mirror will reveal the princess or the queen and that symbol will then remain in place for the free respin. If that spin lands any princesses or queens (depending on what the mirror revealed), they will be held in place for another spin and the process continues until no more matching symbols land. Fairy Magic Spin– Five, six or seven high value symbols will be added to the reels for a spin to help and land a big win. Fairy Surprise– This can trigger after a non-winning spin, it will select a high value symbol from the reels and the lower value symbols will gradually transform into the selected symbol until you land a win. Fairy Mirror– This awards a Mirror Respin. Mining Bonus– Use the pickaxe to hit the nine crystals to win a multiplier of up to 500x. The game continues until all the crystals are open or the pickaxe breaks. Free Spins– You win ten free spins with the Mirror Respin feature active and the mirror able to land on reels two, three and four. Coin Win– You win a multiplier of 15x your line bet. 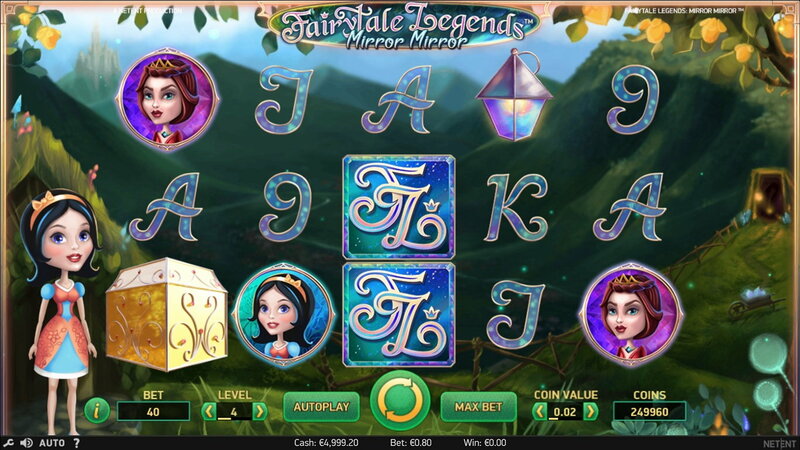 Fairy Tale Legends: Mirror Mirror has a betting range of £0.10 up to £100 per spin, so everyone can enjoy it. There is a top payout of 150x for landing five of the logo symbols on the reels. The princess and queen can both payout up to 75x, and the jewel and lamp can both payout up to 50x. Why not revisit some of your favourite childhood stories and give this bonus packed new slot a try today. If you are interested in Ancient Roman history and wish that you could travel back in time, then you should play the new Soldier of Rome slots from Barcrest that gives you the chance to soak up the Roman atmosphere while playing for big wins. 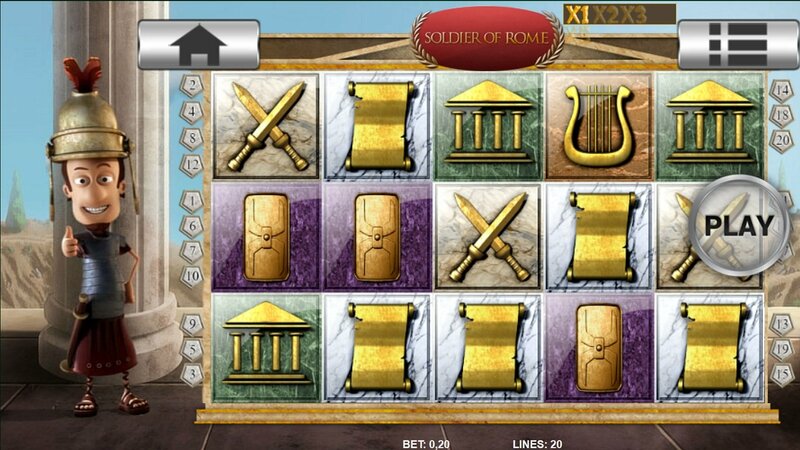 Soldier of Rome has 5 reels, but of different sizes, and up to 100 paylines. The reels are set against crumbling pillars with the soldier looking on from the left hand side. The high value symbols include male and female characters, a chariot, a silver coin, a SPQR standard, and a pair of swords. The playing card suites are the lower value symbols. The soldier is the wild symbol, he will substitute for all of the other symbols, except for the Soldier of Rome scatter symbol, to help and form wins. The wild symbol can land on reels three, four and five, and it is three positions high. Furthermore, if it lands completely in view it will expand to fill the entire reel. The wild will also add more rows to the reels and increase the number of paylines and this is called Mighty Reels. There is a second wild, which is the game’s logo, it features the soldier and can only land on the first two reels. When at least three scatter symbols land on the reels, or three of the game’s logo wilds, you will win ten free spins. However, each extra bonus symbol on the reels will award five more spins up to a maximum of twenty-five. During the free spins the soldier wild only has to be partially visible to trigger the Mighty Reels. Best of all, the free spins can be retriggered. If you land four matching symbols in the four reel positions on reels one and two then you will win a number of ‘Lightning Spins’ in which extra instances of that symbol are added to the other reels. £20 Big Bet – The wild symbols only need to partially land to trigger the Mighty Reels. £30 Big Bet – The £20 advantages and all low value symbols are removed. £50 Big Bet – The £20 and £30 advantages and the Mighty Reels are always active. Soldier of Rome has a betting range of £0.10 up to £500 per spin. There is a top payout of 150x for landing five of the female character symbols along a reel, the male can payout up to 120x, the chariot up to 90x, the coin up to 75x, the standard up to 60x and the swords up to 45x. This is an incredibly exciting slot, so give it a spin today and see what treasures of Rome you can win. 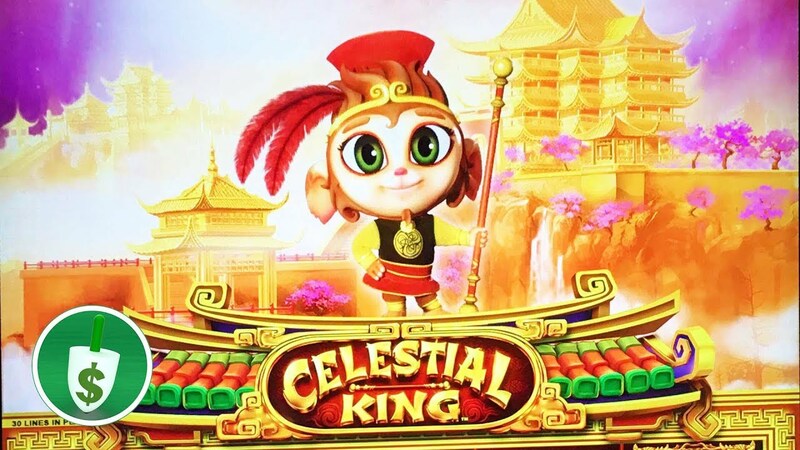 The orient is a regular theme for online slots and now Bally Technologies has made another contribution to the genre with the release of Celestial King slots. Celestial King is a 5 reel slot with 3 rows and 30 fixed paylines. The gold framed reels are set against a view of ornate Chinese buildings under a purple sky. The high value symbols are a priestess, a pig, a golden medal, a coin and a flower. The lower value symbols are the playing cards J, Q, K and A. The king is the wild symbol, he can substitute for all of the other symbols, except for the scatter and bonus symbols, to help and form winning combinations. There is a jackpot wild symbol, a dragon bonus symbol, and a blue scatter symbol. The jackpot wild acts as a normal wild, but if five land on a payline it will award the Grand Jackpot, which is 1,250x your line stake. However, you need to be betting at least £4 per spin to win the prize. If you land three or more dragon bonus symbols anywhere on the reels you will win eight free spins. During the free spins there are no Jackpot Wild symbols on the reels, but the spins can be retriggered indefinitely. When at least five of the blue scatter symbols land anywhere on the reels the Celestial King Respins begin. The symbols remain locked in place and the reels change shape so that reels one, two, three, four and five have three, four, five, six and seven rows respectively. You start with three free spins and the only symbols on those reels will be scatter symbols and the Celestial King. Each scatter that lands freezes in place, awards a multiplier of up to 50x, and resets the number of spins. When no more scatters land the prize of all the multipliers is awarded. The slot has a betting range of £0.50 up to £80 per spin. In addition to the jackpot prize, there is a top payout of 90x for landing five priestesses on the reels, the pig can payout up to 54x, and the medal can payout up to 45x. This is a great addition to the genre of oriental slots, so give it a spin today and see if you can win a share of the Celestial King’s riches. These are just three of the slots to be released in recent days, there have been many more, and more are scheduled throughout August. Be sure to check back regularly so that you do not miss any exciting news.